Before I begin this review, I should point out that while my doctoral dissertation concerned dolphin mortality, and while I might find the dolphins dual brain or two pods cooperation with fishermen in Brazil and Mauritania fascinating, other than perhaps orca art, I dont have any great affinity or enamor with any species of dolphin. Furthermore, I am not a great fan of anthropomorphization. So before I even picked up Ripple, I had already two strikes against it. But pick it up I did, and Ripple is, well, fantastic! 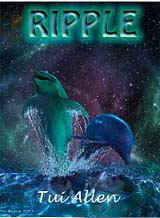 Ripple is the story of a prehistoric dolphin of the same name, roaming the primeval seas. Infused while still in the womb with a tired, worn-out spirit by an interfering deity, she is somewhat of an outcast, driven to find her place in the world, to discover the secret which gives her purpose in life. Ripple interacts with others of her pod, learning and growing in a world beset by predatory sharks, bad weather, and an evil, ravenous cephalopod. But there is also the joy of family, of belonging, of birth, and surfing. Reading the short paragraph above, though, would not entice me to give the book a try. This book stands on the writing, the wordsmithing. It is a lyrical, well-crafted song, a poem in narrative. The author has published childrens fiction before, and that shows through in the clean, descriptive text. There is a little of Rabbit Hill in it, in the rhythm and pace, but I think there is more of Jonathan Livingston Seagull in concept and spirit. But with all due respect to those two books, Ripple transcends them both. Most of the book is in the third-person subjective narrative mode from the point of view of several characters, Ripple being the primary protagonist. But to get some more omniscient information presented, part of the story is told by a deity, who along with a junior deity who imparted the spirit into Ripple, oversees and watches her progress. By providing a narrative voice via a first person viewpoint character, the information provided seems far more real and insightful. As I wrote above, I have no great love or affection for dolphins. No disdain, either, but I am not a delphinophile. However, I loved these dolphins, Ripple and Cosmos, a young male dolphin, in particular. I found myself actually getting stressed, my pulse rate climbing when Ripple was having problems getting her point across to the other dolphins. I was agitatedly asking myself how could they not understand her. I wanted to somehow will myself into the pages and make them see, make them understand. Needless to say, this was a pretty strong reaction for a middle-aged guy lying in bed with his Kindle, reading a book about a fictitious character. That the author was able to arouse my emotions like that is a testament to her skill. The author has a vivid imagination. Dancing within the primary plot are fun, interesting, and engrossing threads which are being woven into a beautiful tapestry. While this is a fantasy, there is still enough biology to keep it running true. Dolphins ram sharks with their rostrums, they eat small squid, they surf waves for the seeming enjoyment of it, they rush to the surface to breath at the moment of birth, and they lift injured or sick dolphins to the surface so they can breathe. The dolphins in the story are in fact dolphins, not just people in dolphin skins. I hate to sound too enthusiastic in praise in my reviews, but in this case, Ripple deserves all accolades. It is one of the best books I have read in a long, long time, and it may have vaulted into my all-time Top Ten list. If anyone gives the slightest value to my opinions, I ask you to take this book and absorb it, treasure it, make it part of you. And if any editor for a publishing house happens to pass by my little review, for goodness sake, grab this and get it out on the wider market. This book deserves a huge readership. I read a lot, and I enjoy the written word. I almost didnt download Ripple, but I thank my lucky stars that I did. Thank you, Tui Allen. For more reviews or to buy Ripple from Amazon.com, click here.